As space scientists were busily altering the complexion of solar system research, space methods were also profoundly affecting the investigation of the universe. Here space science could contribute in a number of ways to solar physics, galactic and metagalactic astronomy, and cosmology, including a search for gravitational waves, observations to determine whether the strength of gravity was changing with time, and studies of the nature of relativity. But the contribution of space techniques to these areas was qualitatively different from those in the planetary sciences. Whereas rockets and spacecraft could carry instruments and sometimes the observers themselves to the moon and planets to observe the phenomena of interest close at hand, this was not possible in astronomy. The stars and galaxies would remain as remote as before, and even the sun would continue to be a distant object extremely difficult to approach even with automated spacecraft because of the tremendous heat and destructive radiation. The connection between the scientist and the objects of study would continue to be the various radiations coming from the observed to the observer. But rockets and satellites would increase the variety of radiations that the scientist could study by lifting telescopes and other instruments above Earth's atmosphere, which was transparent only in the visible and  some of the radio wavelengths. This extension of the observable spectrum proved to be as fruitful to the prober of the universe as were the lunar and planetary probes to the student of the solar system. As stated in chapter 6, rocket astronomy began in 1946 when sounding rockets were outfitted with spectrographs to record the spectrum of the sun in hitherto hidden ultraviolet wavelengths. 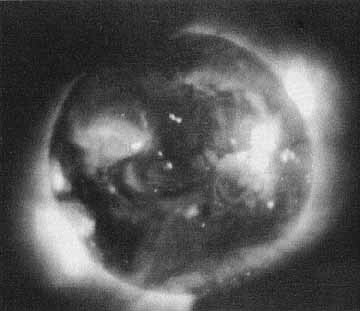 In 1948 x-ray fluxes were detected in the upper atmosphere, after which rocket investigations of the sun ranged over both ultraviolet and x-ray wavelengths. Inevitably experimenters turned their instruments on the skies, and when they did various group found some celestial fluxes that might have been x-rays, but the real ultraviolet sources were found. In 1956 the Naval Research Laboratory significance of x-rays for astronomy had to await more sensitive instruments that did not become available until the early 1960s. In the meantime sounding rocket research on the sun's radiations moved on apace. Investigators from a number of institutions continued to amass detail on the sun's spectrum in the near and far ultraviolet, which was important in understanding the quiet sun and normal sun-earth relationships. But the real excitement proved to be with the x-rays. It was these, rather than the ultraviolet wavelengths, that came into prominence with high solar activity. When satellites came into being, they were put to use in making long-term, detailed measurements of the sun's spectrum in all wavelengths. On 7 March 1962 the first of NASA's Orbiting Solar Observatories went into orbit, to be followed by a series with steadily improving instrumentation. The Naval Research Laboratory built and launched a series of Solrad satellites, intentionally less complex than the OSOs, to provide a continuous monitoring of the sun in key wavelengths. But, while satellites came into prominence in the 1960s, sounding rockets, some of them launched at times of solar eclipse, continued to yield important results. In fact, some scientists felt that the most significant work on the sun came from sounding rockets rather than from the far more expensive satellites. NASA's Orbiting Solar Observatories continued into the 1970s, the first one of the decade being OSO 7, launched on 29 September 1971. An important event for solar research was the launching of Skylab in 1973. In this space laboratory astronauts studied the sun intensively using a special telescope mount built for the purpose. Although the high cost of Skylab's solar mission in dollars and time to prepare and conduct the experiments was distressing to many of the scientists, nevertheless the results were extremely important for solar physics, some of them providing solutions to long unsolved problems. Sounding rocket experiments were also fruitful in stellar astronomy. Perhaps the most significant event in rocket and satellite astronomy occurred when American Science and Engineering experimenters, with an Aerobee rocket flown on 12 June 1962, discovered the first x-ray sources  outside the solar system to be clearly identified as such. As will be seen later, this discovery proved to be of profound significance to modern astronomy. During the 1960s sounding rockets continued to search for and gather information on these strange sources, but progress was slow. Long term observations with more precise instruments were needed, a, need NASA was much too slow in supplying. The breakthrough came with the launching of NASA's first Small Astronomy Satellite, Explorer 42, on 12 December 1970. During the 1960s the course of ultraviolet astronomy from satellites also proceeded slowly. The principal satellite designed for such studies, NASA's Orbiting Astronomical Observatory, proved difficult to bring into being, and it wasn't until the end of the decade that OAO 2 (7 December 1968), the first successful astronomical observatory, went into orbit. It took another four years to get OAO 3 aloft (21 August 1972). From OAO observations the Smithsonian Astrophysical Observatory compiled the first complete ultraviolet map of the sky, issuing the results in the form of a catalog for use by astronomers.49 With OAO 3, which had been named Copernicus in honor of that dauntless pioneer in scientific thought, Princeton University experimenters obtained a number of significant results. They showed that, while hydrogen in the interstellar medium was almost entirely in atomic form, most interstellar clouds had an abundance of neutral hydrogen molecules, the relative abundance being consistent with a balance between the catalytic formation of H2 on grains of material and the competing dissociation of the gas by absorption of light. Much of the galactic disk was found to be occupied by a hot coronal gas at half a million kelvins, with a hydrogen density of one particle per liter. The Princeton workers also observed that the relative abundance of the different chemical elements in the interstellar gas was what would be expected if, starting with a mixture of elements in the ratios found in the overall cosmic abundance, the materials of high-condensation temperatures had already condensed out to form small solid particles or dust grains. Finally, flowing from most very hot stars were stellar winds of some thousands of kilometers per second. Other experiments were also on the OAOs, some of them concerning x-rays and gamma rays, and the Orbiting Astronomical Observatories were clearly proving very fruitful. Yet one could detect the feeling that OAO was a bit out of step. The satellite had been sufficiently difficult to construct that it had delayed satellite optical (visible plus ultraviolet) astronomy for about a decade, whereas a series of cheaper, simpler satellites could have kept research moving while work on a larger instrument proceeded. Also, now that it had come, OAO was well behind both existing telescope technology and current needs. For most of the problems of greatest concern to the optical astronomers, a larger aperture (2.5 to 3 m), more precise telescope was required. As agitation developed for the construction of a  Space Shuttle it was quickly realized that one of the things that the Shuttle could do ideally was to launch such an instrument into orbit and service it throughout the years. The launching of such a telescope became one of the prime scientific missions for the Shuttle. But in the 1970s the circumstances surrounding astronomy had changed. Whereas in 1959 and 1960 the most important tasks for satellites had appeared to be in ultraviolet astronomy, in the late 1960s and early 1970s both ground-based and space research had changed the picture. Now the high-energy end of the spectrum-x-rays and gamma rays-was the center of attention for many astronomers, particularly for the large number of physicists who had moved into the field of astronomy. As a result a number of NASA's sounding rockets and small astronomy satellites were devoted to this area of research. In addition the agency began to plan for outfitting and launching a series of multiton satellites for x-ray and gamma-ray astronomy-to be called High Energy Astronomical Observatories. The importance of this work in the eyes of scientists was shown by the fact that Britain, the Netherlands, and the European Space Agency all instrumented satellites of their own for high-energy astronomy work. The result of all the research with sounding rockets and satellites was an outpouring of data, not obtainable from the ground, at a time when ground-based astronomy was each year turning up new, exciting, often unexplainable discoveries. The quasars had extremely large red shifts in their spectra, suggesting that they were among the most remote of objects observed, yet if they were as remote as indicated, then they would have to be emitting energy at rates that defied explanation. Strange galaxies appeared to have violent nuclei, emitting unexplainable quantities of energy. The discovery of pulsars introduced the neutron star to the scene. Radio galaxies gave evidence of cataclysmic explosions in their centers. The rocket and satellite could not have appeared at a more propitious time. Once stars are born the major part of their evolution can be followed in the optical wavelengths-that is, the visible and ultraviolet. For this reason most attention was directed at launching space astronomy in the direction of ultraviolet studies. Very little thought was given to the higher energy wavelengths, although these were proving to be extremely informative about the sun, particularly about solar activity. But there were a few who thought that one ought to look for celestial x-ray sources. Perhaps the  most insistent was Bruno Rossi, professor of physics at the Massachusetts Institute of Technology. As Rossi later said, while he had not been in a position to predict specific phenomena like the x-ray sources that were eventually discovered, he had had "a subconscious trust....; in the inexhaustible wealth of nature, a wealth that goes far beyond the imagination of man. "50 Moreover, there was a very compelling reason to try to look at the universe in the very short wavelengths. Much has been made of the fact that sounding rockets and satellites gave experimenters their first opportunity to look at all the wavelengths that reached the top of the atmosphere. But, like the atmosphere, interstellar space also had its windows and opacities, and not all wavelengths emitted in the depths of space could reach the vicinity of Earth. While the interstellar medium was quite transparent to wavelengths all the way from radio waves through much of the near ultraviolet, at and below 1216 Å absorption by hydrogen, the most abundant gas in space, cut off radiations from distant objects. Farther into the ultraviolet, absorption decreased again, rising once more when the absorption lines of helium, also abundant in space, were encountered in the far ultraviolet. Not until the x-ray region could one again see (with instruments, not with the eyes) deep into the galaxy. The existence of that window in the spectrum was an important reason for sounding out the possibilities of x-ray astronomy. One could study the universe only in the wavelengths that were available for observation, and all known windows ought to be exploited. Rossi urged his ideas upon Martin Annis and Riccardo Giacconi of American Science and Engineering, who were enthusiastically receptive.51 Quick calculations showed that x-ray intensities one might expect from galactic sources would be well below the detection limit for existing instruments-doubtless explaining why Naval Research Laboratory searches for x-ray sources had not found any. In 1960 NASA provided support to Giacconi and his colleagues and they prepared to fly sufficiently sensitive instruments in sounding rockets. After one failure, the group succeeded in getting an Aerobee rocket to an altitude of 230 kilometers, on 12 June 1962. Although the planned objective of the flight was to look for solar-induced x-radiation from the moon, that objective was completely eclipsed by the excitement of detecting an object in the sky that was apparently emitting x-rays at a rate many, many orders of magnitude greater than the sun. The sheer intensity of the source gave one pause, and the experimenters spent a considerable time reviewing their results before announcing them in late summer. In two additional flights, October 1962 and June 1963, Giacconi's group was able to confirm the original findings and discover additional sources, again detecting a strong isolated source near the center of the galaxy.52 There was also a diffuse isotropic background which one supposed could be extragalactic in origin. Within a few months of Giacconi's original announcement, the Naval Research Laboratory experimenters had confirmed the existence of these sources by independent observations. In April 1963 the NRL group made an important contribution by pinpointing the source near the galactic center more precisely. Since it lay in the constellation Scorpio, the source was named Sco X-1. NRL also detected a somewhat weaker source, about 1/10 the strength of Sco X-1, in the general vicinity of the Crab Nebula.53 During the rest of the decade additional sources were discovered until by 1970 several dozen were known. Efforts were made to discover just what these strange objects were. In particular, it was felt especially important to identify the sources with objects already known in the visible or radio wavelengths. The reason for wanting to tie x-ray sources in with known objects was quite simple. It seemed clear that the extremely intense x-radiation from these sources had to be connected with the basic energetics of the objects. It could be very important then to compare the x-radiation with that in other wavelengths, a comparison that might better reveal the true nature of the phenomenon. As an illustration consider the Crab Nebula.54 It is believed to be the remnant of a supernova explosion. The material of the nebula consists of the debris ejected by the exploding star into the surrounding space. At present this debris, which is expanding at about 1000 kilometers per second, fills a roughly ellipsoidal volume with the major diameter about six light-years-where a light-year is 9500 trillion km. Radiation from the Crab Nebula was observed to be strongly polarized across the whole spectrum, probably resulting from electrons revolving about the lines of force of a magnetic field. At the densities that appeared to exist in the cloud, the lower-energy electrons that would produce the radio wavelengths observed could last for thousands of years, but those responsible for optical wave-lengths would be depleted in a few hundred years and those producing the x-rays in less than a year. Hence there had to be a continuous resupplying of energy to maintain the observed radiations. This remained a mystery until the discovery of a pulsar in the Crab. The end product of a supernova explosion was expected to be a very dense neutron star, in which a mass comparable to that of the sun would be compressed into a ball about 10 kin in diameter. There were reasons to believe that the pulsations from which a pulsar took its name were generated by the rapid spinning of the star. When it was noted that the period of the Crab pulsar was lengthening at the rate of about one part in 2000 per year, a possible source for the resupply of energy to the nebula leapt to mind. The slowdown of the neutron star's rotation corresponded to a considerable amount of energy, and calculations soon showed that the amount was adequate to provide the energy being released by the nebular gases. One speculation had it that the spinning magnetic field of the pulsar accelerated gases to relativistic speeds at which they could escape from the  star's magnetosphere into the nebula, carrying their newly acquired energy with them. Figure 65. Binary x-ray star. Material from the larger, much less dense companion is drawn toward the extremely dense smaller companion and accelerated to velocities sufficient to produce x-rays by collision with the ambient gases. .....great deal of the star's material rebounds from the implosion to be blown out in a supernova explosion, leaving behind an extremely dense object consisting of neutrons. But if the residual mass after the supernova explosion is greater than a certain critical value, the gravitational contraction of the star does not stop even at the neutron star stage. Instead the star continues to contract indefinitely, pulling the matter tighter and tighter together until the object disappears into a deep gravitational well out of which neither matter nor electromagnetic radiation can escape because of the intense gravitational fields there. Hence the name "black hole." The binary nature of some of the x-ray objects could be deduced from the doppler shifts in the light from the ordinary companion, the shift being toward the blue as the star moved toward the observer in its orbit, and toward the red as the star moved away. If the stars eclipsed each other the binary nature would show up in a periodical disappearance of the x-rays when the emitter was hidden by the other star and reappearance when the emitter emerged from eclipse. Should one then conclude that rocket and satellite astronomy had by the early 1970s generated a scientific revolution in the field of astronomy? The answer may well be yes, although many of the strange concepts that were being dealt with had been considered decades before.59 In any event, it is probably too early to make the case. Certainly these topics, concerning the interplay of energy and matter on a cosmological scale, are fundamental; and if anywhere in the space program one might expect a scientific revolution to emerge, it would be here. But it should also be noted that if any such revolution is to arise, it would almost certainly come from a cooperation between ground-based and space astronomy. The sun was a most important target of space science investigations for at least two reasons. First, the sun's radiation supports life on Earth and controls the behavior of the atmosphere. For meteorology it was important to know the sun's spectrum in the visible, infrared, and near-ultraviolet wavelengths. To understand the various physical processes occurring in the upper atmosphere, a detailed knowledge of the solar spectrum in the ultraviolet and x-ray wavelengths was essential. The reader will recall the overriding importance that S. K. Mitra, in his 1947 assessment of major upper-atmospheric problems, gave to learning about the electromagnetic radiations from the sun (pp. 59-60). For this reason many sounding rocket experimenters devoted much of their time to photographing and analyzing the solar spectrum both within and beyond the atmosphere. Some of their work before the creation of NASA was discussed in chapter 6. Finally, with the discovery of the magnetosphere and the solar wind the importance of the particle radiations from the sun for sun-earth relationships became apparent, a topic that was treated in chapter 11. Thus, solar physics was of central importance in the exploration of the solar system. But the sun was important also to astronomy, to the investigation of the universe. Although an average star, unspectacular in comparison with many of the strange objects that astronomers were uncovering in their probing of the cosmos, nevertheless it is a star, and it is close by. The next star, Proxima Centauri, is 4.3 light-years (400 trillion kilometers) away, while most of the stars in the galaxy are many tens of thousands of lightyears distant. Stats in other galaxies are millions and even billions of lightyears from earth. So the sun afforded the only opportunity for scientists to study stellar physics with. a model that could be observed in great detail. Because of its nearness and its importance, astronomers amassed a great deal of data and theory about the sun in the years before rockets and satellites.60 What they learned came almost entirely from observations in the visible, with only occasional glimpses from mountain tops and balloons at the shorter wavelengths. But, as space observations showed, much of solar activity, particularly that associated with the sunspot cycle, solar flares, and the corona involved the short wavelengths in essential ways. Sounding rocket and satellite measurements were, accordingly, able to round out the picture in important ways. To understand the significance of these contributions, a brief summary of the principal features of the sun may be helpful.61 The visible disk of the sun is called the photosphere (fig. 66). It is a very thin layer of one to several hundred kilometers thickness, from which comes most of the radiation one sees on Earth. The effective temperature of the solar disk is about 5800 K. Above the photosphere lies what may be called the solar atmosphere; below it, the solar interior. The sun's energy is generated in the interior, from the nuclear burning of hydrogen to form helium in a central core of about one-fourth the solar radius and one-half the solar mass. Here, at temperatures of 15 X 106 K, some 99 percent of the sun's radiated energy is released. This energy diffuses outward from the core, colliding repeatedly with the hydrogen and helium of the sun, being absorbed and reemitted many times before reaching the surface. In this process the individual photon energies continually decrease, changing the radiation from gamma rays to x-rays to ultraviolet light and finally to visible light as it emerges from the sun's surface. From the core of the sun to near the surface, energy is thus transported mainly by radiation. But toward the surface, between roughly 0.8 and 0.9 of the solar radius, convection becomes the principal mode of transporting energy toward the surface. The existence of the convection zone is evidenced by the mottled appearance of the photosphere in high-resolution photographs. This mottling, or granulation as it is called, consists of cells of about 1800-km diameter which last about 10 minutes on the average and which are thought to be associated with turbulent convection just beneath the photosphere. A larger scale system of surface motion-20 times the of the granulation cells, called supergranulation-is believed to be much more deeply rooted in the convection zone. Analogous to Earth's upper atmosphere is the chromosphere, or upper atmosphere, of the sun. The chromosphere overlies the photosphere and is about 2500 km thick. While the density drop across the photosphere is less than an order of magnitude, density in the chromosphere decreases by four orders of magnitude from the top of the photosphere to the top of the chromosphere. Figure 66. Idealized structure of the sun. Idealized structure of the sun (not to scale). There is a complex interplay among the different regions of the sun. Edward G. Gibson, The Quiet Sun , NASA SP-303 (1973), p.11, fig.2-3. Above the chromosphere lies the corona, the sun's exosphere. Here 1000000 K temperatures prevail, and an important problem facing the solar physicist was to explain how the corona gets its energy. Although the corona is extremely hot and very active, its density is so very low that it is not normally visible from the ground, where it is completely obscured by scattered sunlight in the earth's atmosphere. Only during solar eclipses, with the moon blocking out the sun's disk, could the astronomer get a good look at the entire corona. One of the benefits of rockets and satellites was to permit carrying coronagraphs above the light-scattering atmosphere where the corona could be seen even in the absence of a solar eclipse. Much of solar physics concerns the interplay among the different regions of the sun. This interplay, however, can be followed only in terms of its effect upon the radiations emitted from those regions. For this reason, one of the first tasks of the astronomer was to obtain good spectra of the sun and their variation with time. Regions from which radiations of highly ionized atoms came would be hot regions, and temperatures could be estimated. The magnetic field intensities, for example in sunspots, could be estimated from the splitting of lines emitted within the field. If a cooler gas overlay a hotter, similar gas, the cooler gas would absorb some of the light emitted by the hotter one. This would produce reversals in the emission lines of the hotter gas, generating the famous Fraunhofer lines of the solar spectrum discovered in the 19th century. By piecing together information of this kind, the locations of different gases relative to each other and their temperatures could be determined. Changes in magnetic field that occurred in association with solar activity, such as the appearance of solar flares, could be followed. Changes were important, since there were strong indications that magnetic fields were the source of much of the energy in solar flares. A powerful technique for study of the sun is that of imaging the sun in a single line; for example, the red line emitted by hydrogen known as hydrogen alpha. In such spectroheliograms, as they are called, one can see the structure and activity of the sun associated with that line. Spectroheliograms taken in hydrogen, calcium, and other lines in the visible have long been an effective too) for the study of solar activity. Members of the Naval Research Laboratory group pioneered the use of this technique in space astronomy, where it was possible to get spectroheliograms in both the ultraviolet and x-rays.64 These, taken with photographs in the visible, gave a powerful means of discerning and analyzing active regions on the sun. Sequences of such images taken over many days, or at intervals of 27 days, the solar rotation period, permitted one to follow the evolution of flares and other features on the sun. It was in this sort of imaging that Skylab was particularly fruitful. Figure 67. Coronal structure of the sun. X-ray pictures of the sun show a great deal of structure in the solar corona, including dark coronal holes and hundreds of intense bright spots. The x-ray photo above was taken by the Skylab Apollo telescope mount 28 May 1973 in an American Science and Engineering, Inc., experiment. NASA photo. See also Giuseppe Vaiana and Wallace Tucker in X-ray Astronomy, ed. R. Giacconi and H. Gursky (Dordrecht-Holland: D. Reidel Publishing Co., 1974), pp. 170-71, fig.5.1a and 5.1b. .....chromosphere. It would not be the chromosphere that was heating the corona in violation of the laws of thermodynamics. On the contrary, the corona, heated by energy from within the sun, would itself be heating the top of the chromosphere. The importance of rocket and satellite solar astronomy lay in the integrated attack that the researcher could now make in seeking to understand the nearest star, an integrated attack made possible by opening up the window that the earth's atmosphere had so long kept shut. It was an importance attested to by the large numbers of solar physicists who bent to the task of assimilating the new wealth of data. By the end of the 1960s the early years of space science were well behind. More than a dozen disciplines and subdisciplines had found sounding rockets and spacecraft to be powerful tools for scientific research. Thousands of investigators turned to these tools to help solve important problems. Moreover, while the disciplines to which the new tools could contribute were many and varied, there was a clearly discernible melding of groups of disciplines into two major fields: the exploration of the solar system and the investigation of the universe. The pursuit of these two main objectives would grow in intensity as space science moved into the 1970s-in spite of fears prevalent in the late 1960s that support for space science was waning. The new decade would witness the scientific missions of Apollo to the moon, the remarkable solar astronomy from Skylab, breakthroughs in x-ray astronomy, and the serious start of a survey of all the important bodies of the solar system. It was eminently clear that space scientists would be important clients of the Space Shuttle, which was intended to introduce a new era in space activities. Because of their accomplishments, the scientists could legitimately ask that the Shuttle be tailored as much to their requirements as to other space needs.